Back in the early 80's when I arrived in Tennessee, there was a "renewable resource' program, which, among other things, made low/no interest loans to people to install wood-burning stoves in their homes. Some folks acquired dual fuel stoves with these loans. Then . . . They wired the shaker grate closed with soft wire, and burned a wood fire in it for the required inspection. Then, after the inspection, they got a ton of 'free' coal from the county, the first coal fire melted the wire, and, voila!, a coal stove with free fuel for a year. Others installed solar water heaters on their roofs with the same taxpayer financed incentives. Look for those now. They are hard to find. When people re-roofed their homes, they got rid of those things. 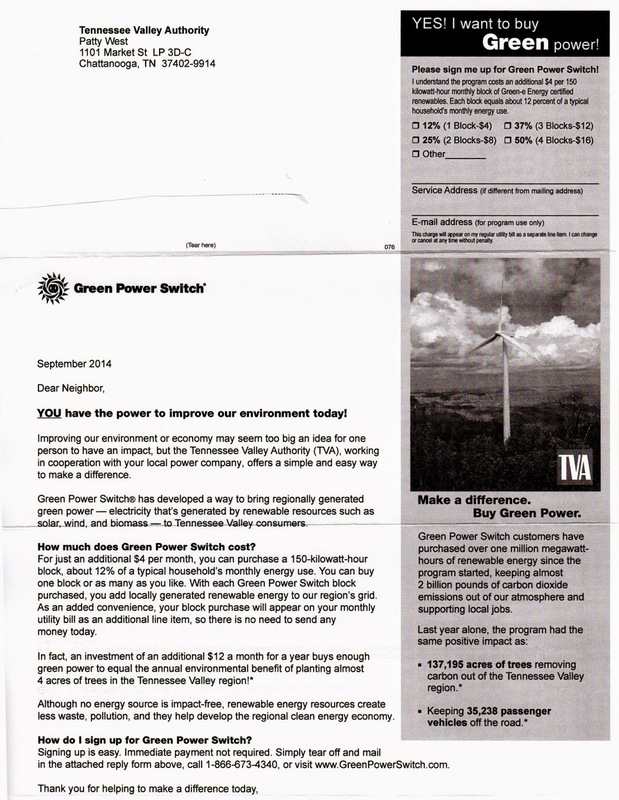 Now, TVA wants me to pay extra to get some electricity from windmills I have no interest in voluntarily paying for another boondoggle just to make the likes of Algore feel good. Making a difference is not always a good thing. Think Joe Stalin. He made a big difference for many people. Meanwhile, ORNL, after spending $$$ on a biomass generator, has figured out that they need a natural gas steam generator. The answer is to quit chasing this pipe dream with the taxpayers' money, get more energy from our own land (but not sawgrass), feed corn to cows, and wean ourselves from foreign oil!